It is the no 1 kajal in India that no wonder every girl have this colossal kajal in their pouch. This kajal claims to stay 12 hr without smudging and fading. It has a intense black pigmentation and just one to two swipes makes your eyes gorgeous. This kajal comes under budget friendly makeup products. 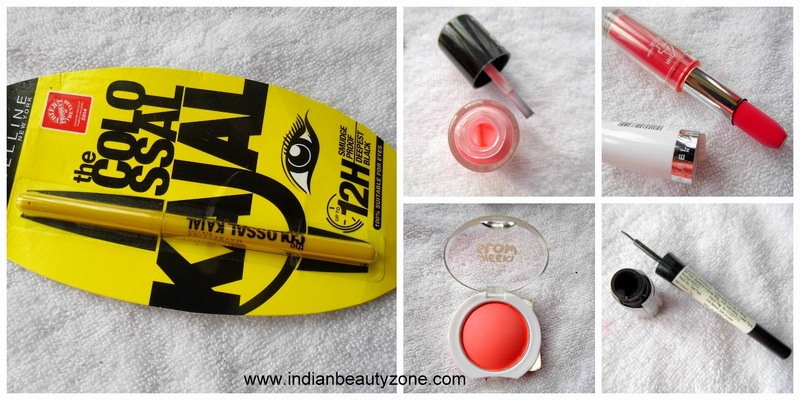 We have reviewed this Kajal already in our blog. This Cheeky glow blush comes in a cute round plastic container that every girl can carry it with them in their pouch and very easy to apply, just a few swipes makes your cheeks blushed. This blush available in 3 shades. This blush also comes under budget friendly category. This is the best liquid eyeliner with a glossy finish. I swear every liquid eyeliner lover will have this eyeliner in their makeup stash mostly. The quick dry and glossy look makes this eyeliner gorgeous and it is available in some other shades too. This nail paint is a big hit product from Maybelline among girls, I have almost all the shades from this color show range. The shades and finish of this nail paint is just awesome and vibrant. This is a budget friendly nail paint with good quality. Maybelline has launched this super stay lipstick a year back with pretty shade collections. This lipstick stays for more than 6 to 7 hours on the lips and the pigmentation is simply great. The long stay lipstick is loved by every girls when it was launched in India. The Five makeup goodies are very useful to create a simple and elegant makeup look easily. After your base makeup done, apply Maybelline Colossal Kajal on your lower water line and smudge it slightly to make it a smokey look, in the upper eye lid apply the Glossy liquid eyeliner to add a glamorous look for your eye makeup. Now apply cheeky glow blush on your cheeks and then the super stay lipstick on your lips, now finish the makeup look with applying the color show nail paint on your nails. That's it, your are done to rock your party. Some nice things in the pouch. Love the pouch. In fact I think it can be a small time evening pouch too. I wish they had an option to just buy the pouch coz most girls already own all these MNY pdts. Nice idea though! This pouch is the perfect gifting option for make up lovers.. looks lovely! The pouch looks super pretty! I have always wanted to try their blushes..